Show me your 67-72 4x4 Suburbans! Might as well throw frank the tank in this thread. 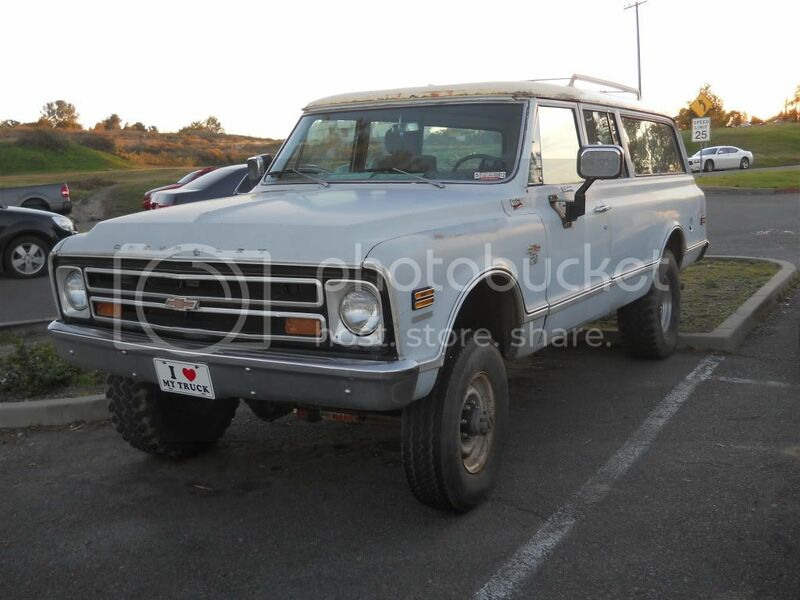 68 K20 4" lift 35s Toroflow V6 Diesel/5spdOD/Div Dana 23. Will be swapped with a 91.5 Cummins/G360/205/D60F after this next deployment. 84 GMC C1500 SWB 6.2 Diesel/700R4/3.42 "Grandpa's odd duck"
68 K20 Suburban 12V Cummins/NV5600/NP205/D60/11.5AAM 3.73s "Dakota Cadillac"
63 Chevy II Nova Coupe 250 I6/T56/4.56s "Economy car"
Last edited by Thatguy; 11-21-2010 at 10:56 PM. I love it! Very tough. You would think as tax payers that should be automatic! Wow! I am just blown away at all the awesome 'Burbs here! Hope to see some updates or a build thread on yours in the near future! Now this is how I want my floor in the rear to look after I complete the sheetmetal. Please give us more details on your super installation of this floor system. Last edited by C20-67_N_MO; 11-27-2010 at 11:16 AM. Reason: added recognition for all these 4x4 Suburbans! I love your 'burb and flooring but my beast will be doing work with a touch of class and I really love what you have done to the floor. Just give me some idea how you pulled that job off. Well, I put a new tire on my suburban! Or I shredded a 35 monday morning on the way to work and threw a spare on the front. Surprisingly it still tracks straight! I knew the tires were dry rotted when I bought the truck but hoped they would work until I finished the cummins swap. So I'm going down to DRMO tomorrow to see if I can bid on some HMMWV tires and trade my aluminum 16s wheels with a buddy who has steel 16.5s and wants my wheels. I like your plan on the tires! Considering your line of work, I figured you could easily get some good tires that would look great on your burb. Be sure to post up pics of your burb with her new shoes! Found out with Sammy's help this was used by US Army Corps of Engineers. Dating from 1995-1999 is the last stickers on the back of the rear view mirror. Here's mine from 2 years ago (in it's original primer), when it was last driven. I really need to quite procrastinating and finish it. 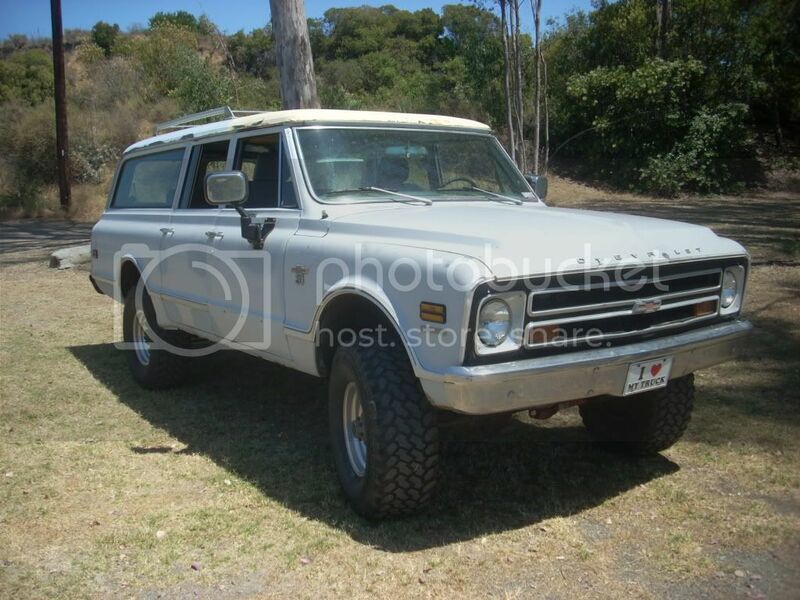 1971 Suburban 4x4, LQ4 6.0L, 4L80E, etc. 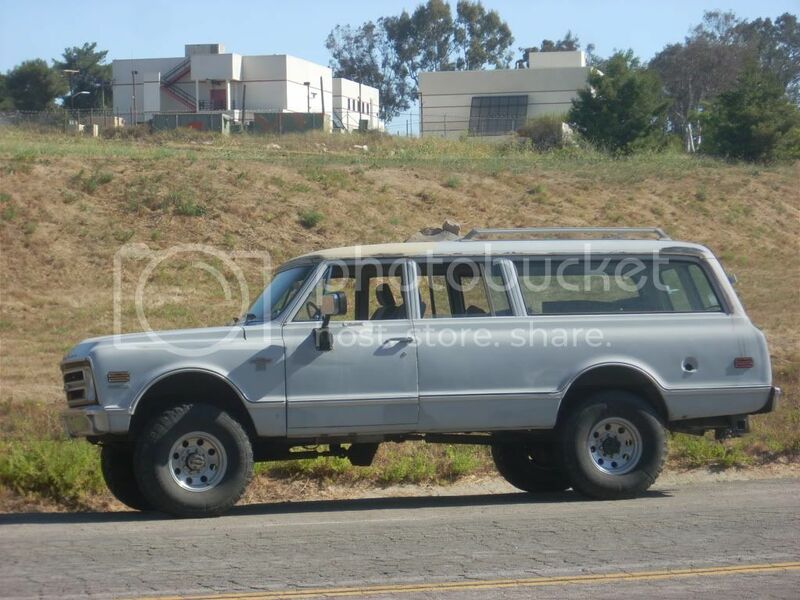 4x4 Burb in my future. I do realize and respect how much time and money go into doing one of these with the jacked up stuff but I would prefer to do mine like the original with the factory buckets and console and a set of 6 bolt rally wheels,which I already have and maybe put a 68 front clip on as I love the front end of the 67/68 trucks. I'm dealing on this one in Minnesota and as usual it took the owner two wekks to return my call and I've been waiting 3 days now for the more detailed pictures he was going to send the next day. I bootlegged the attached pics from the CL ad and that is why they are small. Well join the club man! I knew if I was going to own a Suburban it had to be 4x4 and not a wimpy 4x2. Hoping to really enjoy it soon and then slowly restore it when time and money permits. 1. Find the most expensive one you can afford. Less restoring and more enjoying. 2. Slowing restore to your tastes not anyone elses! 3. Then Enjoy the heck out of it and use it how it was intended to be used! When I started to look... I wanted 4x4 - for winter trips to a family cabin (mud/snow). I came across a lot of nice 4x2s, but held out until I found the one I wanted (4x4). I think you'd have a nice 4x4 with your plans mentioned above. That's a nice burb you're looking into.... keep us posted! You don't see too many original looking 4x4s... so you'd have something that's admired by many. Not usually into the 4 eyes, but yours is very COOL! Thank you! I see you have a 4x4 burb in your sig... With an olds! When I had my 69 GMC pick-up I had a 403 that almost made its way in there. I would love to see pictures of yours! I saw this one on Craig's list also. It looks really clean! Good Luck!